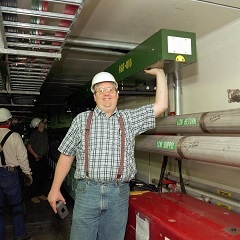 Dr. Howe received his Ph.D in nuclear engineering from Kansas State University after completing his thesis research in experimental particle physics at the Los Alamos National Laboratory in 1980. After a one year stay at the Kernforschungszentrum Karlsruhe in West Germany as a visiting scientist, he returned to Los Alamos as a staff member in the Thermonuclear Applications Group. During the four years in the group, he was appointed design physicist for two nuclear tests at the Nevada Test Site and supervised research efforts investigating fundamental physics in dense, high temperature plasmas. Dr. Howe then joined the Laboratory's systems analysis group that analyzed various concepts proposed for the Strategic Defense Initiative. During this time, he became involved in examining potential Laboratory programs and technologies pertinent to future space missions such as space radiation modeling, antimatter physics, Mars Mission requirements, space debris mitigation, and advanced propulsion technologies. Dr. Howe has extensive experience in radiation transport modeling. 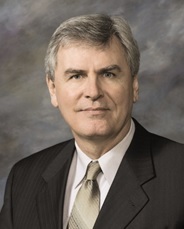 In August, 2015, Dr. Howe stepped down as founding Director of the Center for Space Nuclear Research (CSNR) at the Idaho National Laboratory in Idaho Falls, ID. For 10 years he led the CSNR in facilitating research and education of nuclear technologies for space exploration. At the CSNR, he initiated the development of a radioisotope-powered Mars Hopper, a revolutionary, small, radioisotope power source for micro-satellites, a new nuclear rocket design that uses low enriched uranium, and the fabrication of tungsten based fuels for nuclear reactors for power and propulsion in space. He also initiated and oversaw the CSNR Summer Fellows program which has educated over 150 participants from 27 states over a 10 year period in the issues of nuclear technologies in space. Before entering the private sector in the autumn of 2000, Dr. Jackson was an accelerator physicist at the Fermi National Accelerator Laboratory ("Fermilab") for 14 years. He received his doctorate in Physics from Cornell University in 1987. His thesis committee included Nobel Prize winner Kenneth Wilson, and his thesis advisor Robert Siemann was one of a long line of influential physicists, including Robert Wilson (Manhattan Project and Founder of the Fermilab) and Ernest Lawrence (Nobel Prize winner and inventor of the cyclotron). Dr. Jackson has published an extensive body of work in the areas of beam physics, accelerator technology, deep-space propulsion, nuclear physics, and medical physics. He was co-recipient of the 1999 IEEE Accelerator Technology Award (along with current-congressman Dr. G. William Foster) for his design and construction leadership of a 2-mile circumference particle accelerator, was inducted as a fellow of the American Physical Society, and elevated to senior member of the IEEE. He has an international reputation in the areas of instrumentation, vacuum technology, robotics, particle beam control, facility construction, and space propulsion, earning him many invitations to present invited talks and teach. His work has been profiled in Scientific American and in the book "Physics of the Impossible" by popular physicist Michio Kaku. He served on U.S. Department of Energy ("DOE") high energy physics institutional reviews, having reviewed the programs of DOE cabinet secretaries Stephen Chu and Ernest Moniz He is also a referee for scientific peer reviewed journals, SBIR grant proposals, and accelerator research grant proposals In 2000 Dr. Jackson received a Federal Energy and Water Management Award, and in 2002 he received a Federal Energy Saving Showcase Award. In 2002 he co-founded the company Hbar Technologies, LLC which performed research projects funded by NASA, the DOE, and DARPA. I am Gerry Jackson. I am doing a Reddit AMA!